← How do you distinguish between spiritual voices? I was in Seagull in Springville recently, and they don’t have VoG anymore. They said that they sold all that they have and that if someone wants to buy it they have to special order it. Last night I checked with Cedar Fort, our publisher, and my marketing person contacted our Seagull rep who is over all the Seagull stores. He reported that Seagull Book is indeed still distributing “Visions of Glory,” and in fact just had more cases shipped to them. So perhaps the Springville Seagull staff meant that if a customer wanted VoG that day, they would have to special order it; either that or they were misinformed. I know that the local Costco stores have both books readily, and they are only $10.99 each there. I do appreciate your heads-up on this! I read Visions of Glory last year and bought 4 books and have been passing them around. As I started to read Spencer’s dreams I had to put the book down and get out my journal. I started writing as many of my dreams down that I could remember. As I read Visions of Glory I was blown away with the similarities of my own dreams. I have seen what Spencer saw. Before this book I thought I just had crazy dreams – but how can two people have the same dream? Now I write my dreams down and share them with my family. I wish I could talk to Spencer and share our experiences. I’m sure other people have seen similar visions, we are VERY close to seeing prophecy fulfilled. We will soon see the Preisthood Power unleashed on this Earth, we are a blessed generation. 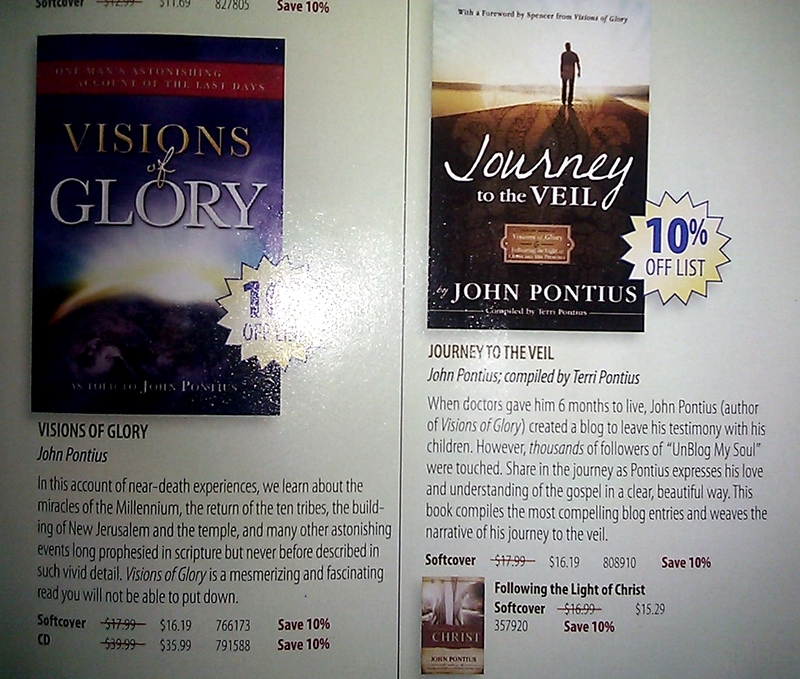 I absolutely loved both of the books…”Visions of Glory” and “Journey to the Veil”. They were both amazingly uplifting and truly a spiritual experience. Especially “Journey to the Veil”. So many books tell us what kind of people we should be…(i.e. : what we should be doing, not doing, etc.) But John told us how to do it. I have never had a more spiritual experience reading, outside of the scriptures. These books, and Johns’ amazing and clear writing style, made me feel that real spiritual progression is attainable! I could not have felt the Spirit so strongly if this book wasn’t inspired. I feel very grateful to have found books written by John Pontius. They have changed my life forever. I also loved “The Triumph of Zion”! We need to awaken, as it says in Moroni 10:31, and arise from the dust, and prepare ourselves to be a Zion person/society. I could really talk forever in gratitude and praise for all of John’s books. Thanks so much for making them available to all. I truly believe they were brought forth at this time to prepare us, as a people, for the Second Coming of Jesus Christ. Sandra, I do appreciate your kind and gracious comment here! And I apologize that I am just now getting to the “UnBlog” to post these recent comments; I have been very busy hosting our family reunion these past four days. I deeply appreciate you and all the UnBlog family (as John called you) for your unique insight and perspective. I do agree, as well, that the Spirit’s guidance is absolutely critical in reading any gospel-oriented book, and in knowing how it may or may not pertain to you and your spiritual path, as directed by the Spirit. Thanks again! Hi, I just put my letter in the mailbox to go out. I was more than happy to do it. I almost felt obligated to do it. I very much hope the letters do some good. I am reading both books a second time and suspect they will be read again and again. I give thanks for both of them and the man who wrote them. I am positive he did it with divine assistance for the betterment of any who will read them. I cannot say enough good about them both. I look forward to meeting Brother Pontius someday, to thank him for his help in my life’s journey. I am farther along than I would have been. Love to all who are connected to this project and who are striving to live a more abundant life. The Unblog alerted me that I need to tell you of my experience with John Pontius’ books. I have read them all. Following the Light of Christ 7 times. Triumph of Zion 5 times. Visions of Glory twice, Journey to the Veil twice. I guess you never read any of them yourself?! I can’t imagine that you have, and then could consider that they are having a negative impact on anyone’s life! These books illuminated my soul and provided the impetus in my life that led me to receiving divine personal inspiration in my life. These books turned my life around so drastically that when John heard my story, he called me personally! I love him dearly, and count him as one of my eternal friends. I have distributed these books to dozens of friends in my Stake and Ward, and in every case, people have been uplifted, edified, and begun living a better life. The gospel of Jesus Christ is succinctly and simply laid out by John for anyone to easily be able to understand and follow. If you are getting negative comments, just realize it should be expected from this world of iniquity in which we live today. So What? Are you going to cave like so many other companies and organizations to a bit of counter-point and reverse an earlier decision? I exhort you to make a stand with the righteous and resist whatever is being thrown at you or possibly risk your eternal happiness otherwise. Pray about it. Ask your Father in Heaven what to do, and do what He tells you. There is nothing less that will do in this day of unrighteousness. I found the two books an enjoyable read and inspiring. If anything they, increased my testimony, took nothing away. I know and feel the truth. These books are a better read than all the negative things going around about the Church, trying to turn people away. “There has been a great difficulty in getting anything into the heads of this generation. It has been like splitting hemlock knots with a corn-dodger [a piece of corn bread] for a wedge, and a pumpkin for a beetle [a wooden mallet]. Even the Saints are slow to understand. Brother John Pontius is a Saint and in the truest sense of the Life he lived. Both John and Spencer have become the Christlike character they chose… not just to the LDS Church but to the world. I honour them both for their compassion, integrity and selflessness. Looks like the Adversary is busy trying to keep us down. A letter will be going out soon!!! Just sent my letter of thanks and gratitude for Brother John’s books…”By their fruits ye shall know them”…and the fruit of Brother John’s books are so sweet to me! God bless you Sister Pontius and your sweet family, and I thank God for allowing me to be guided to the light I have found in all of Brother John’s books! The truth and light of the Lord that I have found through my studies have filled my soul with hope and love and light, and my heart is so full of gratitude this day! Forever thankful! Thank you for your comment. I too wanted to say, “By their fruits ye shall know them.” I have shared the book (Visions of Glory) with many people and the majority of them absolutely loved the book. There was only 1-2 people who told me that it just got too strange for them. I wanted to ask them, ‘What is the fruit of the book? Do you have a greater resolve to be a better person after reading it? Did you at any time feel the Spirit leave while reading?’ I know for me that I felt the Spirit during the entire course of the book. I know that I did not read anything that contradicted the core doctrine of the restored gospel. I know that it helped me in so many areas of my life. I particularly loved the part about loving others and trying not to judge anyone, and the part about even our thoughts being so powerful. However I was not surprised to find out that there were those who were fighting the book. In fact, if there was no negative feedback, that would be more worrisome to me, than the fact that there is. I am very grateful for the opportunity to read this book, and Journey to the veil. Thank you for all of your hard work and sharing your sweet testimony with all of us! I had so much anger growing up because of the physical and emotional abuse as a child. As an adult I yearned for Understanding and True Repentance. These two books helped me to understand my relationship with the Holy Spirit in a very simple way. It doesn’t matter what church or belief system you follow as long as it teaches you to love another. I grew up catholic and went to many different church’s trying find the place where I belonged. Eventually I found the LDS Church and knew that this is where I needed to be. You don’t need to be LDS to understand the lessons being taught in these two books. I’ve been and member for over 20 years and still wasn’t at peace and had no understanding of true repentance. The nightmares of my abuse would kindle up this rage within me and I was so untrusting and judgemental of people, even people I loved. As a child I remember having so much love and trust towards people and I wanted to find that child again. These two books Changed My Life!!! After reading Vision’s of Glory I realized I had a lot in common with Spencer. Then I read Journey to the Veil and it blew me away. Brother Pontius teaches in the most simple and thought provoking way possible. I finally had a true understanding of The Holy Spirit and was able to act upon these teachings into my own life. I’m 47 years old and this past year as been life changing for me. I finally understand Peace and True Repentance!!! It’s so hard to say in words what I am trying to express, only that this anger and frustration no longer binds me down towards darkness, I finally see a light, The Light of Christ! I’ve read and hungered for knowledge for so long, I read every book in the LDS library from Joseph Smith to Nibley, I knew that I needed more understanding. I know that the LDS Church does not hold the monopoly on spiritual knowledge and that as true members we are commanded not to judge the beliefs of others. We are all Fathers Children and he love us all. I know the the adversary is real and have know since childhood. I realized after reading Visions and Journey that the adversary was going to attack the teachings in these books. These two books are a threat to darkness because it teach us to find our way towards light, in a way that can be implemented into our own life. It does this in the most simple, loving and understanding way. Brother Pontius work here, I believe was to help us understand our relationship with the Holy Spirit. As for me, I Love Brother Pontius! His books are and will continue to be help those like myself, who are still searching for more truth and knowledge, so that we can return to our Heavenly Father! The books by John M. Pontius have done more to motivate me toward a higher, more noble state of existence and living by the Voice of the Lord, than anything I’ve ever experienced. The books I have are all published by CFI (Cedar Fort). I don’t know if this is synonymous with Seagull Book or not, but the only negative comment I would have about these books is that the paper back book’s binding doesn’t hold the pages very well, but lets them fall out pretty easily. Other than that, I can’t imagine why anyone could have anything negative to say about John’s books. Maybe they find it too discouraging because it is a challenge to live on a higher spiritual plane.